31 Oct, 2017 by	Margaret M.
Don’t rob a liquor store. Especially don’t rob a liquor store when Jon Lewis Alexander is behind the counter. 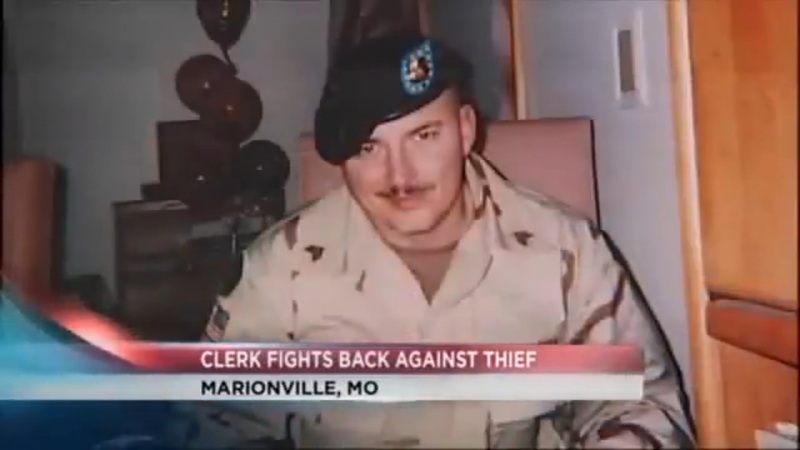 In Marionville, Missouri, a man entered a liquor store smoking a cigarette and had his actions all caught on the security camera behind the cashier. Alexander told the man to leave the store due to his smoking, but the robber said, “You need to give me all your money.” First he smokes up his store, then he pulls out a gun? That’s just disrespectful, especially the poor grammar. It was just a bad plan all over. This wasn’t bravado or recklessness on the part of Alexander. You see, Jon Lewis Alexander is an armed Iraq veteran. If you watch the video, you can see the moves Alexander makes to keep the would-be robber’s gun pointed away from his own face. The incident may have happened in 2013, but it’s still a great watch. Anyway, the 44 year-old cashier looked at the man in a ski mask when he entered, telling him, “That’s not a good look to be walking into a store,” and when the robber put the note on the counter and made as if he had a gun, cashier Wayon Fields, a former correctional officer at the County Jail, pulled out his own pistol. He said that he usually had his pistol on him because his ex-inmates usually recognize his face. If you needed a reason to stop holding up gas stations and liquor stores, the sheer number of ex-military and ex-law enforcement looking to have a quieter gig, but who are still prepared to make your day unpleasant, should be more than enough.